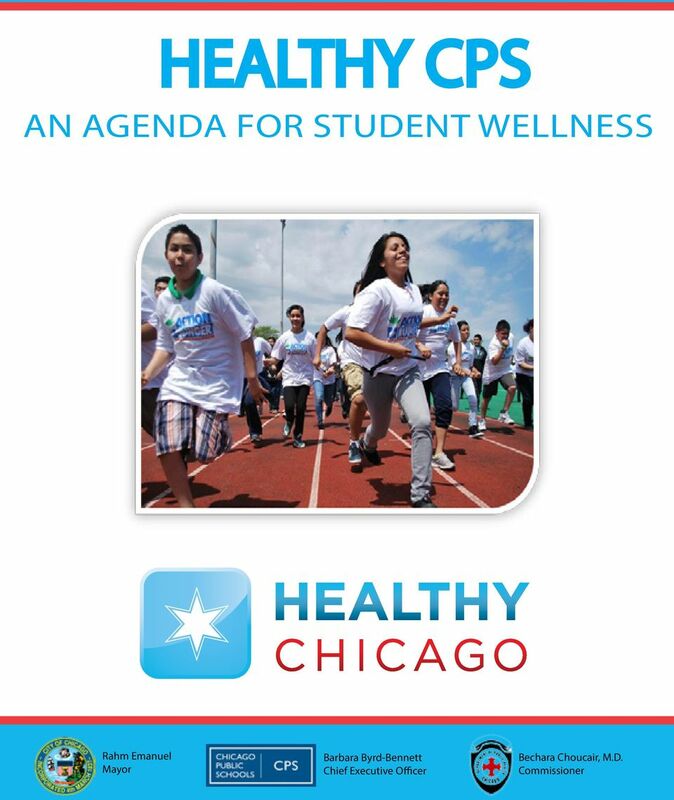 Download "HEALTHY CPS. Rahm Emanuel Mayor. Bechara Choucair, M.D. Commissioner. Barbara Byrd-Bennett Chief Executive Officer"
3 INTRODUCTION The Chicago Public Schools (CPS) is the third largest school district in the nation, with 675 schools and 404,151 students. Eighty-six percent (86%) of the students are either African American (42%) or Latino (44%); 87% come from low-income families. Given the size and characteristics of its student population, CPS is wellpositioned to positively impact the health and well-being of Chicago s children and youth. 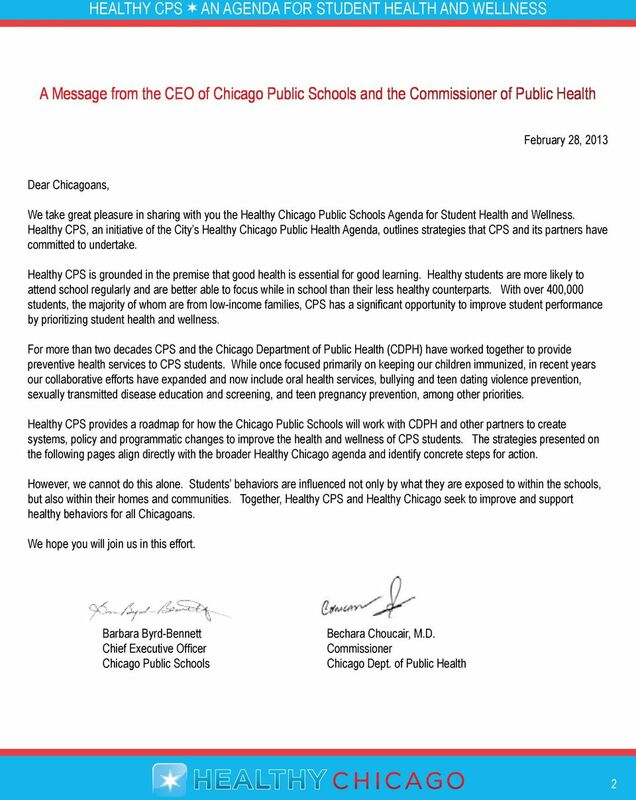 The February 2012 appointment of a Chief Health Officer and the subsequent reorganization of the Coordinated School Health staff under her direction further strengthen CPS s health improvement capacities. While efforts should be focused on health improvement in the broadest sense, consistent with CPS educational mission, priority must be given to preventing and addressing those health conditions that directly impede learning. Healthy CPS identifies nine sets of actionable strategies that align with the City s Healthy Chicago priorities. 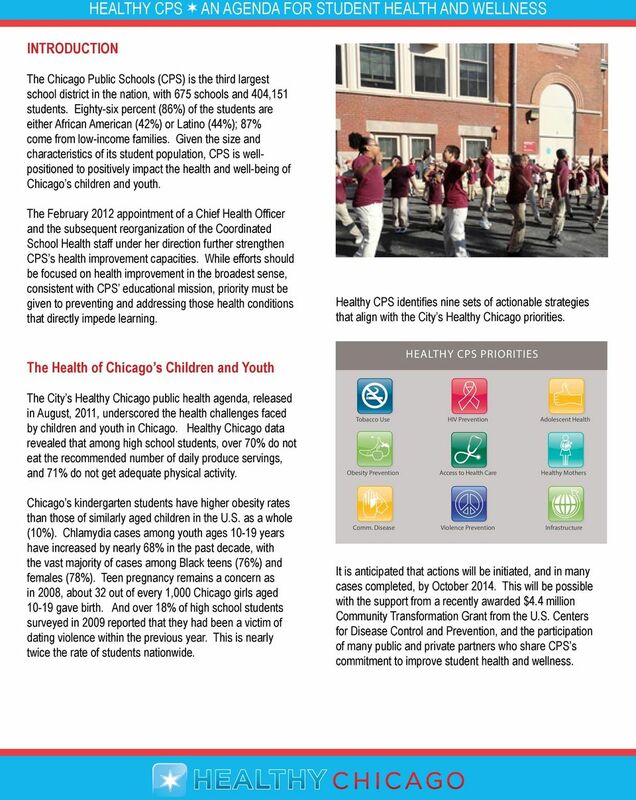 The Health of Chicago s Children and Youth HEALTHY CPS PRIORITIES The City s Healthy Chicago public health agenda, released in August, 2011, underscored the health challenges faced by children and youth in Chicago. Healthy Chicago data revealed that among high school students, over 70% do not eat the recommended number of daily produce servings, and 71% do not get adequate physical activity. Tobacco Use Obesity Prevention HIV Prevention Access to Health Care Adolescent Health Healthy Mothers Chicago s kindergarten students have higher obesity rates than those of similarly aged children in the U.S. as a whole (10%). Chlamydia cases among youth ages years have increased by nearly 68% in the past decade, with the vast majority of cases among Black teens (76%) and females (78%). Teen pregnancy remains a concern as in 2008, about 32 out of every 1,000 Chicago girls aged gave birth. And over 18% of high school students surveyed in 2009 reported that they had been a victim of dating violence within the previous year. This is nearly twice the rate of students nationwide. Comm. Disease Violence Prevention Infrastructure It is anticipated that actions will be initiated, and in many cases completed, by October This will be possible with the support from a recently awarded $4.4 million Community Transformation Grant from the U.S. Centers for Disease Control and Prevention, and the participation of many public and private partners who share CPS s commitment to improve student health and wellness. 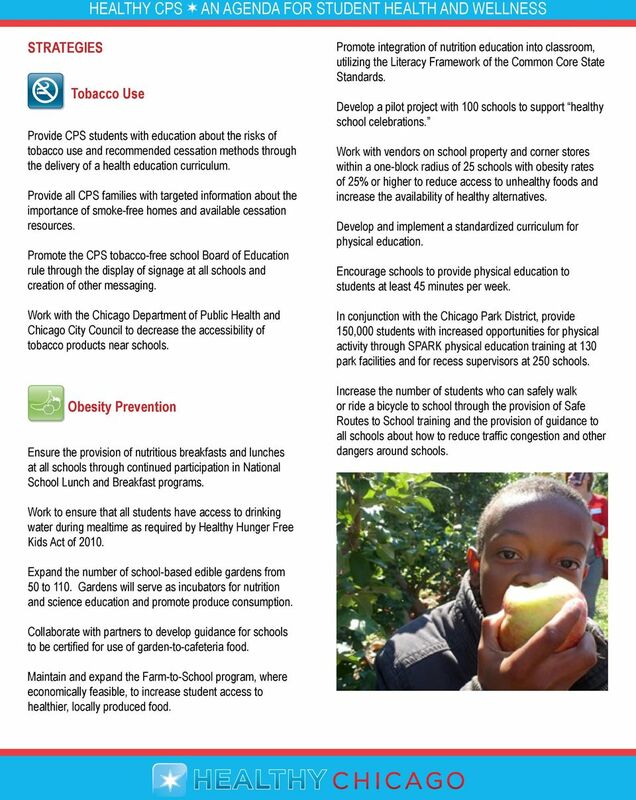 4 STRATEGIES Tobacco Use Provide CPS students with education about the risks of tobacco use and recommended cessation methods through the delivery of a health education curriculum. Provide all CPS families with targeted information about the importance of smoke-free homes and available cessation resources. Promote the CPS tobacco-free school Board of Education rule through the display of signage at all schools and creation of other messaging. Work with the Chicago Department of Public Health and Chicago City Council to decrease the accessibility of tobacco products near schools. Obesity Prevention Ensure the provision of nutritious breakfasts and lunches at all schools through continued participation in National School Lunch and Breakfast programs. Promote integration of nutrition education into classroom, utilizing the Literacy Framework of the Common Core State Standards. Develop a pilot project with 100 schools to support healthy school celebrations. Work with vendors on school property and corner stores within a one-block radius of 25 schools with obesity rates of 25% or higher to reduce access to unhealthy foods and increase the availability of healthy alternatives. Develop and implement a standardized curriculum for physical education. Encourage schools to provide physical education to students at least 45 minutes per week. In conjunction with the Chicago Park District, provide 150,000 students with increased opportunities for physical activity through SPARK physical education training at 130 park facilities and for recess supervisors at 250 schools. Increase the number of students who can safely walk or ride a bicycle to school through the provision of Safe Routes to School training and the provision of guidance to all schools about how to reduce traffic congestion and other dangers around schools. Work to ensure that all students have access to drinking water during mealtime as required by Healthy Hunger Free Kids Act of Expand the number of school-based edible gardens from 50 to 110. Gardens will serve as incubators for nutrition and science education and promote produce consumption. Collaborate with partners to develop guidance for schools to be certified for use of garden-to-cafeteria food. Maintain and expand the Farm-to-School program, where economically feasible, to increase student access to healthier, locally produced food. 5 Develop and implement a strategy for supporting the productive use of recess time, including partnerships with local parks for 50 schools in need of space. Assess and monitor integration of physical activity by reporting on the annual school wellness survey. Eliminate the use of food or fitness opportunities (including recess) as rewards or punishments. Support schools in implementing healthy school fundraising strategies. Strengthen support for the implementation of school wellness programs. Collaborate with partners to implement the evidence-based Teen Outreach Program to ninth-graders annually at 23 high schools in communities with high rates of teen births and STIs. Implement, in partnership with CDPH, the Chicago Dating Matters Initiative to reduce the incidence of teen dating violence. Design and implement a plan for the strategic growth of school-based health centers (SBHCs) based on community need, available health care resources, and CPS facilities planning. Support schools in their efforts to meet the criteria for HealthierUS School Challenge through school-based technical assistance (Go for the Gold) and district-wide policy changes. Encourage and support peer-to-peer health education models whenever possible. Expand work with partner organizations to engage high school students in advocating for school wellness policies and programs that address obesity and other health concerns. Work with strategic partners to actively engage parents in school wellness efforts. Initiate an employee wellness program. Adolescent Health In partnership with the Chicago Department of Public Health (CDPH), provide targeted chlamydia and gonorrhea education, screening, and treatment to students in communities with the highest sexually transmitted infection (STI) rates. Increase CPS student access to adolescent immunizations, including HPV and Tdap. Access to Care Develop a citywide adolescent health access plan in conjunction with adolescent service partners. Evaluate the current nursing strategy and recommend staffing models to maximize access to school health services and support students with chronic conditions such as asthma and diabetes. Establish and implement a pilot effort for Health Education Resource Rooms (HERR) in CPS high schools to provide students with comprehensive health education tools and resources. 6 Create a strategy for increasing the nurse to student ratio, working towards the national standard of 1:750. In partnership with CDPH, provide all schools with access to onsite oral health exams, cleanings, fluoride treatment, and sealants. 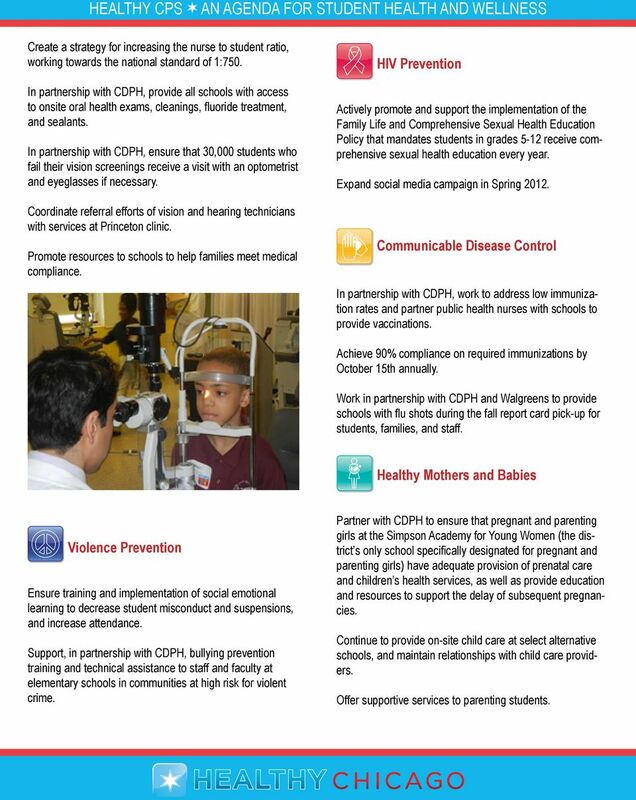 In partnership with CDPH, ensure that 30,000 students who fail their vision screenings receive a visit with an optometrist and eyeglasses if necessary. Coordinate referral efforts of vision and hearing technicians with services at Princeton clinic. Promote resources to schools to help families meet medical compliance. HIV Prevention Actively promote and support the implementation of the Family Life and Comprehensive Sexual Health Education Policy that mandates students in grades 5-12 receive comprehensive sexual health education every year. Expand social media campaign in Spring Communicable Disease Control In partnership with CDPH, work to address low immunization rates and partner public health nurses with schools to provide vaccinations. Achieve 90% compliance on required immunizations by October 15th annually. Work in partnership with CDPH and Walgreens to provide schools with flu shots during the fall report card pick-up for students, families, and staff. Healthy Mothers and Babies Violence Prevention Ensure training and implementation of social emotional learning to decrease student misconduct and suspensions, and increase attendance. Support, in partnership with CDPH, bullying prevention training and technical assistance to staff and faculty at elementary schools in communities at high risk for violent crime. Partner with CDPH to ensure that pregnant and parenting girls at the Simpson Academy for Young Women (the district s only school specifically designated for pregnant and parenting girls) have adequate provision of prenatal care and children s health services, as well as provide education and resources to support the delay of subsequent pregnancies. Continue to provide on-site child care at select alternative schools, and maintain relationships with child care providers. Offer supportive services to parenting students. 7 School Health Infrastructure Establish an Office of Student Health and Wellness to be led by the Chief Health Officer, hired by CPS in partnership with CDPH. Identify and promote comprehensive health education curricula to ensure the delivery of comprehensive health education to all K-12thgraders. Conduct a survey of all CPS schools to determine current health-related programming and identify gaps. Utilize findings to inform strategies. Strengthen data sharing efforts by developing and implementing a plan to identify, collect and analyze all available CPS and CDPH data that promotes a better understanding of student health needs. 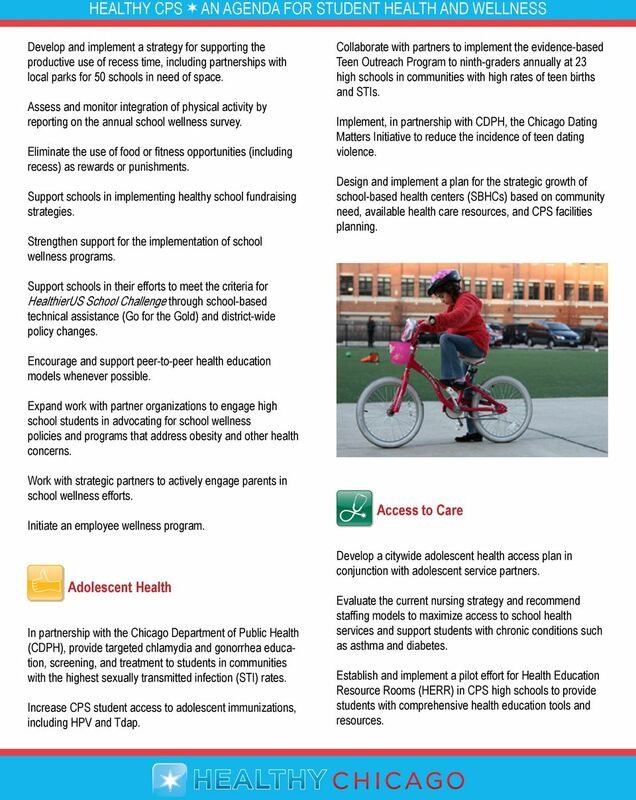 Provide training to staff at all CPS schools regarding the revised CPS Wellness Policy and new Competitive Foods Policy. Conduct annual review of school health data and report results. Increase the number of schools with identified Wellness Champions from 250 to 500 over the next three years to provide a focused resource and coordinated communications for school wellness improvement efforts. Work with schools and the CPS Youth Development team to establish Students for a Healthy Chicago. 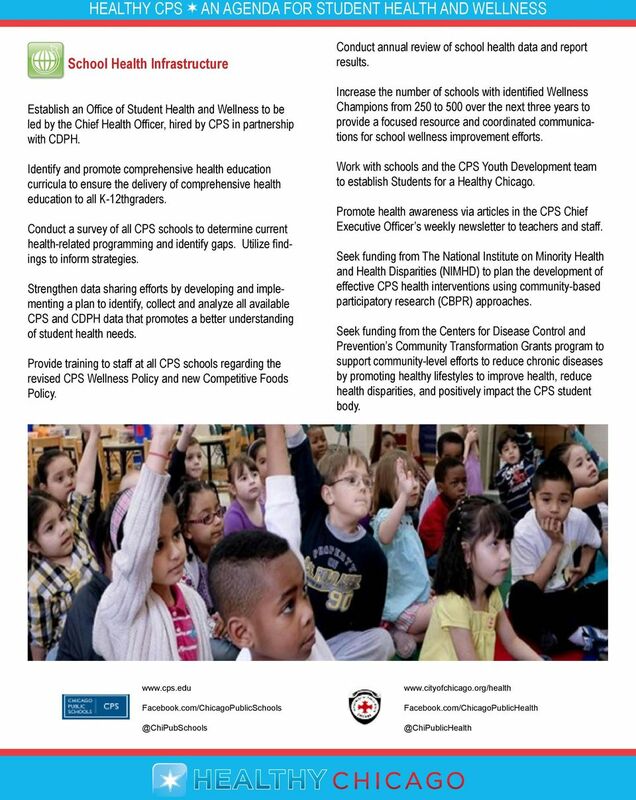 Promote health awareness via articles in the CPS Chief Executive Officer s weekly newsletter to teachers and staff. Seek funding from The National Institute on Minority Health and Health Disparities (NIMHD) to plan the development of effective CPS health interventions using community-based participatory research (CBPR) approaches. Seek funding from the Centers for Disease Control and Prevention s Community Transformation Grants program to support community-level efforts to reduce chronic diseases by promoting healthy lifestyles to improve health, reduce health disparities, and positively impact the CPS student body. Chapter 3 Section 3.03 Ministry of Education Healthy Schools Strategy Background While academic success is a major priority for the Ministry of Education (Ministry), so too is student health and well-being. What kind of work does Shape do? LOVE! Healthier me! Steps to a. Show Your. My top 3 goals for this year are 1 2.